The new installation of our blog will treat the function of the Statistics of Ristomanager, the best method to monitor the results of your activity. Thanks to its powerful filters, you will be able to know the trends of sales even from a single table, in a precise period. Ristomanager Statistics are critical to understand the strengths and risks of your business. 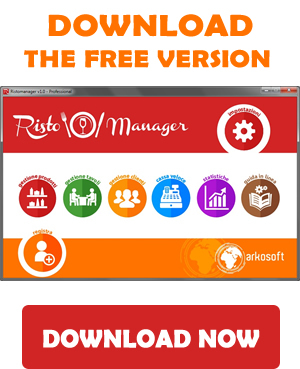 What immediately jumps to the eye when you view the Statistics of Ristomanager, is the completion of the data, which are displayed in a table of clear reading and easy consultation, accompanied in the lower part, by a graph with the trend of sales of a given period, which you can decide before generating the statistics. 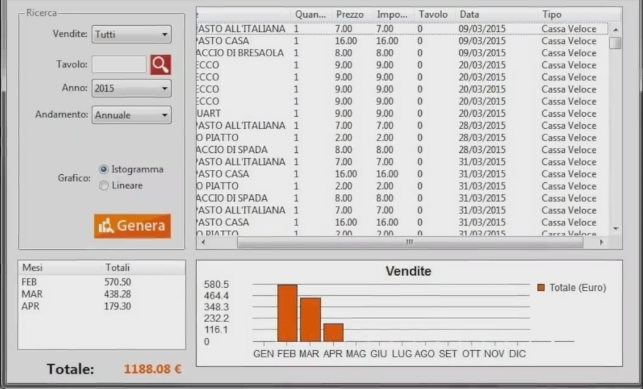 The Ristomanager statistics allow you to filter data in various ways: you can first choose the type of “Sales” you want to consult, or “Fast Cash” or “Ordinations”, filter sales for a single table (option not available if you choose sales from “Cassa Veloce”), or consult those of a specific “Year”. It is also possible to establish that the trend should follow the chart below, so you can know the sales of a whole year (previously selected from the appropriate menu) divided by month, or those of a specific month which are selected from the menu that appears choosing the ” “>” Monthly “trend. All these filters can be easily combined, allowing you to know every detail of your business, for example getting to know the sales and even what was ordered by a hypothetical table called “Fantasia” in a single day of March 2015 . You can finally choose the type of graph between “Histogram” and “Linear” depending on which you find easier to understand much better . Next to the graph, you will see a list of sales broken down by Months (if you have chosen the “Annual” Trend) or by Days (by choosing the “Monthly” Trend) with the total sales for that period. In the blog you will find all this information along with many others, so we suggest you to take a look at it by clicking on the image in this same article. Wishing you a good view, we will meet you at the next episode of our blog! Ristomanager: how to insert photos of products. 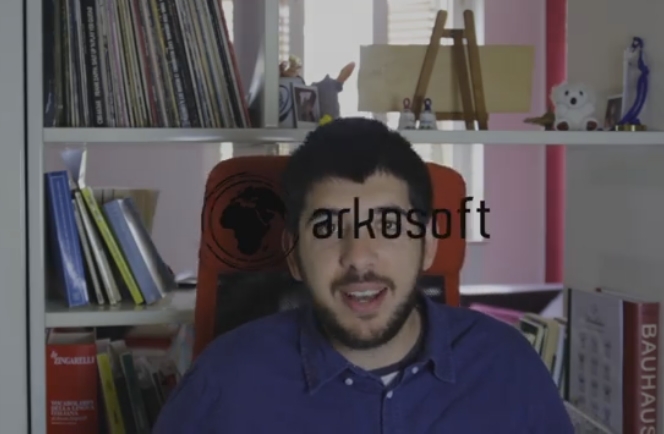 Welcome back to the usual appointment with our Vlog by Ristomanager, focused this time on a particular aspect of the management of products and dishes within the software, namely the insertion of images of the products, to facilitate the functions of Cassa Fast and inclusion in the orders. 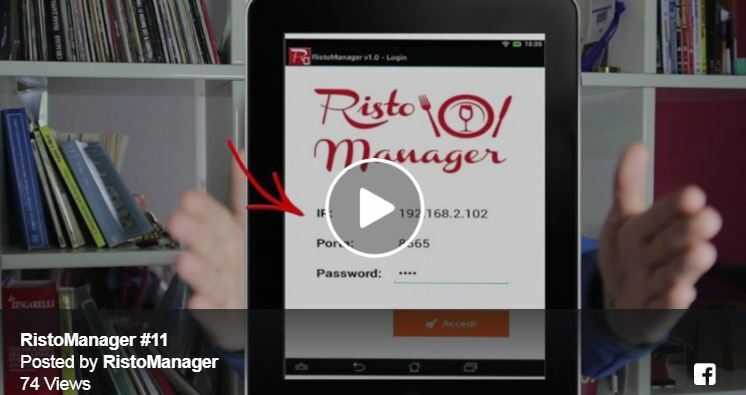 As we have already mentioned previously in Vlog number 7, in which we have dealt with product placement, in Ristomanager it is possible to assign a specific image for each product, regardless of its Type (which as said are Warehouse or Dish). This function proves extremely useful for the immediate recognition of the various products inside the Cassa Veloce, a mode specifically designed for take-away service, but also useful in bars for ordering consumer products or why not, for example in the case where offer a list of the different cocktails available. You can easily assign an image to the products, both in the moment in which they are created through the function dedicated to this purpose, and add them later to existing products; in this second case, simply access the product management function starting from the main interface and then modify the product or dish of your interest, then view the “Images” tab, within which you will have two comfortable options for assigning the image to the product. The first option allows you to select one of the images already present in Ristomanager, with a wide selection of images divided into product categories and dishes, but you can also in any case choose images of your liking, carefully selected by yourself.